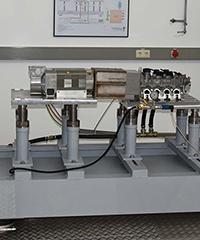 ACE Mounts Protect Oil-Pump Test Bench From Unwanted Vibration – ACE Controls Inc.
Students at the South Westphalia University of Applied Sciences have an ambitious goal: they want to reduce the fuel consumption of combustion engines by making oil pumps more efficient. As part of their research, they constructed a large testing station consisting of oil pumps, motors and other equipment on top of a large bench. But the problem was the motor that drove the pumps caused the entire bench to shake—threatening the equipment and making it difficult to obtain accurate measurements. According to the research team, the key to making drives more efficient lies in the engine’s oil pump—by reducing flow rate, then it is also possible to reduce power consumption. The students analyzed the hydraulic, volumetric and mechanical characteristics of various oil pumps to see how they could improve flow behavior—particularly, how to avoid leakage and reduce friction. As part of the test setup, they constructed a large 1,500-kg test bench and placed various equipment on top of it, including oil pumps and an electric motor that drove the pumps at a speed of 300 to 7,000 revolutions per minute. These speeds, however, caused the bench to vibrate. Not only did the vibration cause the bench to shake, threatening the equipment on top of it, but the vibrations were strong enough to affect other test benches in the room. The university team turned to ACE Controls. For the test bench, ACE engineers opted for six low-frequency pneumatic leveling mounts (PLMs), which isolate machines from undesirable vibrations and impact forces while maintaining perfect leveling. These components are suitable for low-frequency applications between 3 and 10 Hz, including high-speed presses, measuring tables, fans and air compressors. Since integrating the ACE mounts, the test bench no longer shakes. The students can carry out their research without fear the vibration will affect their equipment and have been able to take important steps towards achieving more energy-efficient drive systems.